This is Utagawa Kunikane, signing "Kunikane hitsu". 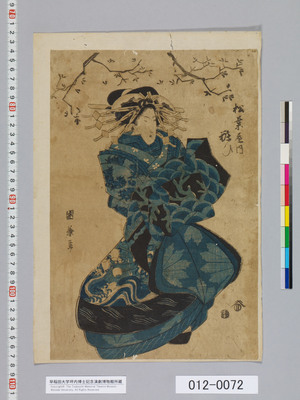 Pictured is a courtesan of the Yoshiwara brothel Matsubaya (松葉屋). Her name is given by the Waseda University Theatre Museum, which has a copy, as "粧ひ" -- I don't know the correct reading of that, perhaps "Shōhi"?